Make everyone aware of breast cancer by using this unique Personalized Breast Cancer Awareness Shoulder Bag. 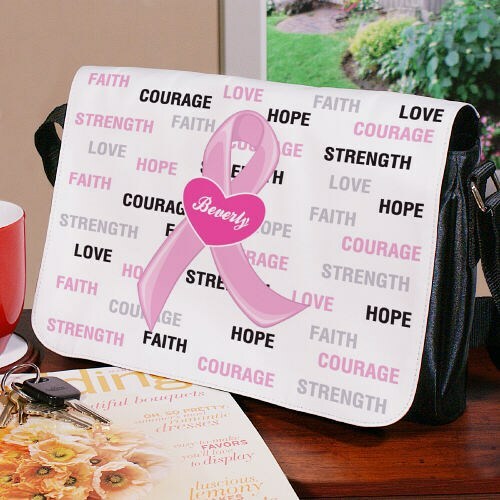 This Personalized Breast Cancer Bag is the perfect way to show your support and hope that one day we will find a cure. Take our breast cancer bags everywhere you go, whether it’s to breast cancer walk events, the gym or the grocery store. It’s the perfect reminder to support those looking for a cure. Our Stylish Breast Cancer Awareness Large Shoulder Bag with Detachable White 10'' x 12.5'' Flap measures 8"h x 12"w. The black sateen purse features an adjustable shoulder strap, inside pocket zipper closure under the flap. Includes FREE Personalization! Personalized with any name. Shop at MyWalkGear.com for all your Personalized Breast Cancer Awareness Gift ideas. We have a large collection of Breast Cancer Gifts that are perfect for fund raisers and events. Browse through our collection of Personalized Breast Cancer Walk T-Shirts and Sweatshirts to show support for those fighting for a cure.